Shakuntala, also known as The Recognition of Shakuntala, The Sign of Shakuntala, and many other variants (Devanagari: अभिज्ञानशाकुन्तलम् – Abhijñānashākuntala), is a Sanskrit play by the ancient Indian poet Kālidāsa, dramatizing the story of Shakuntala told in the epic Mahabharata. It is considered to be the best of Kālidāsa's works. Its date is uncertain, but Kālidāsa is often placed in the period between the 1st century BCE and 4th century CE. :[Forest scene with King Dushyanta on a hunting expedition]. And leaves no trace upon th' elastic turf. Now, Charioteer, see me kill the deer. Hold, O King! this deer belongs to our hermitage. Kill it not! kill it not! Great King, some hermits have stationed themselves so as to screen the antelope at the very moment of its coming within range of your arrow. Hermit:This deer, O King, belongs to our hermitage. Kill it not! kill it not! Restore, great Prince, thy weapon to its quiver. May heaven indeed grant thee a son, a sovereign of the earth from sea to sea! Is the Chief of your Society now at home? but he has commissioned her in his absence to entertain all guests with hospitality. The inhabitants of this sacred retreat must not be disturbed. Here is the entrance to the hermitage. I will now go in. This way, my dear companions; this way. Hark! I hear voices to the right of yonder grove of trees. I will walk in that direction. Ah! here are the maidens of the hermitage coming this way to water the shrubs, carrying water-pots proportioned to their strength. But what am I saying? In real truth this bark-dress, though ill-suited to her figure, sets it off like an ornament. -Dushyanta. Anasúyá: Dear SHAKOONTALÁ, one would think that father Kanwa had more affection for the shrubs of the hermitage even than for you, seeing he assigns to you, who are yourself as delicate as the fresh-blown jasmine, the task of filling with water the trenches which encircle their roots. SHAKOONTALÁ: Dear Anasúyá, although I am charged by my good father with this duty, yet I cannot regard it as a task. I really feel a sisterly love for these plants>....Good Anasúyá, Priyamvadá has drawn this bark-dress too tightly about my chest. I pray thee, loosen it a little. Can this be the daughter of Kanwa? The saintly man, though descended from the great Kasyapa, must be very deficient in judgment to habituate such a maiden to the life of a recluse. With the soft edge of a blue lotus-leaf. Well! concealed behind this tree, I will watch her without raising her suspicions. Why do you lay the blame on me? Blame rather your own blooming youthfulness which imparts fulness to your bosom. What Priyamvadá says, though complimentary, is nevertheless true. Of youthful beauty, as the tree with bloom. - Dushyanta. But what am I saying? In real truth this bark-dress, though ill-suited to her figure, sets it off like an ornament. The Keshara-tree, whilst your graceful form bends about its stem, appears as if it were wedded to some lovely twining creeper. Ah! saucy girl, you are most appropriately named Priyamvadá('Speaker of flattering things'). She is wishing that as the jasmine is united to a suitable tree, so, in like manner, she may obtain a husband worthy of her. Speak for yourself, girl; this is the thought in your own mind. How charmingly your friendship is in keeping with the equality of your ages and appearance! - King Dushyanta. How now! he is following me here. Help! my dear friends, help! deliver me from the attacks of this troublesome insect[Bee]. How can we deliver you? Call Dushyanta to your aid. The sacred groves are under the King's special protection. All is well indeed, now that we are honoured by the reception of a distinguished guest. Dear Shakoontalá, go, bring from the hermitage an offering of flowers, rice, and fruit. This water that we have brought with us will serve to bathe our guest's feet. The rites of hospitality are already performed; your truly kind words are the best offering I can receive. How is it that the sight of this made me sensible of emotions inconsistent with religious vows? How charmingly your friendship is in keeping with the equality of your ages and appearance! Your kind words, noble Sir, fill me with confidence, and prompt me to inquire of what regal family our noble guest is the ornament? what country is now mourning his absence? and what induced a person so delicately nurtured to expose himself to the fatigue of visiting this grove of penance? May I be allowed, in my turn, to ask you maidens a few particulars respecting your friend? The sage Kanwa lives in the constant practice of austerities. How, then, can this friend of yours be called his daughter? I will explain to you. Sir. You have heard of an illustrious sage of regal caste, [[w:Vishwamitra|Vishwámitra, whose family name is Kaushika....Know that he is the real father of our friend. The venerable Kanwa is only her reputed father. He it was who brought her up, when she was deserted by her mother. 'Deserted by her mother!' My curiosity is excited; pray let me hear the story from the beginning. The rest may be easily divined. Shakoontalá, then, is the offspring of the nymph....It is quite intelligible. How would a mortal to such charms give birth? The lightning's radiance flashes not from earth. And so my desire has really scope for its indulgence. Yet I am still distracted by doubts, remembering the pleasantry of her female companions respecting her wish for a husband....I am so eager to hear the particulars of your friend's history, that I have still another question to ask. I wish to ascertain one point respecting your friend. Will she be bound by solitary vows Opposed to love, till her espousals only? Hitherto, Sir, she has been engaged in the practice of religious duties, and has lived in subjection to her foster-father; but it is now his fixed intention to give her away in marriage to a husband worthy of her. Anasúyá, I shall leave you...That I may go and report this impertinent Priyamvadá to the venerable matron, Gautamí. Ah! a lover's feelings betray themselves by his gestures. Spare her this trouble, gentle maiden. The exertion of watering the shrubs has already fatigued her. Suffer me, then, thus to discharge the debt for you. [Offers a ring to Priyamvadá. Both the maidens, reading the name Dushyanta on the seal, look at each other with surprise. ]...Nay, think not that I am King Dushyanta. I am only the King's officer, and this is the ring which I have received from him as my credentials. The greater the reason you ought not to part with the ring from your finger. I am content to release her from her obligation at your simple request. Now, Shakoontalá, my love, you are at liberty to retire, thanks to the intercession of this noble stranger, or rather of this mighty prince. O hermits, be ready to protect the animals belonging to our hermitage. King Dushyanta, amusing himself with hunting, is near at hand. Noble Sir, we are terrified by the accidental disturbance caused by the wild elephant. Permit us to return to the cottage. Go, gentle maidens. It shall be our care that no injury happen to the hermitage....The mere sight of you, sweet maidens, has been to me the best entertainment. Anasúyá, a pointed blade of Kusha-grass has pricked my foot; and my bark-mantle is caught in the branch of a Kuruvaka-bush. Be so good as to wait for me until I have disentangled it. (Scene: A plain on the skirts of the forest). The hearts of both are ripe for his delights. King Dushyanta. Oh! here he comes, attended by the Yavana women, with bows in their hands, wearing garlands of wild flowers. What shall I do? I have it. I will pretend to stand in the easiest attitude for resting my bruised and crippled limbs. Here are you living the life of a wild man of the woods in a savage unfrequented region, while your State-affairs are left to shift for themselves; and as for poor me, I am no longer master of my own limbs, but have to follow you about day after day in your chases after wild animals, till my bones are all crippled and out of joint. Do, my dear friend, let me have one day's rest. Victory to the King! We have tracked the wild beasts to their lairs in the forest. Why delay, when everything is ready? My friend Máthavya here has been disparaging the chase, till he has taken away all my relish for it....My good General, as we are just now in the neighbourhood of a consecrated grove, your panegyric upon hunting is somewhat ill-timed, and I cannot assent to all you have said. Recall, then, the beaters who were sent in advance to surround the forest. My troops must not be allowed to disturb this sacred retreat, and irritate its pious inhabitants. Máthavya, it may be said of you that you have never beheld anything worth seeing; for your eyes have not yet looked upon the loveliest object in creation. If, as you intimate, she is a hermit's daughter, you cannot lawfully ask her in marriage. You may as well then dismiss her from your mind, for any good the mere sight of her can do. Think you that a descendant of the mighty Puru could fix his affections on an unlawful object? As his own daughter, in this hermitage. This passion of yours for a rustic maiden, when you have so many gems of women at home in your palace, seems to me very like the fancy of a man who is tired of sweet dates, and longs for sour tamarinds as a variety....I can quite understand it must require something surpassingly attractive to excite the admiration of such a great man as you. Make haste, then, to her aid; you have no time to lose, if you don't wish this fruit of all the virtues to drop into the mouth of some greasy-headed rustic of devout habits. Why, of course, my dear friend, you never could seriously expect that at the very first sight she would fall over head ears in love with you, and without more ado come and sit in your lap. You must know, my good fellow, that I have been recognised by some of the inmates of the hermitage. Now I want the assistance of your fertile invention, in devising some excuse for going there again. The inhabitants of the hermitage, having heard of your Majesty's sojourn in our neighbourhood, make this humble petition:In the absence of our Superior, the great sage Kanwa, evil demons are disturbing our sacrificial rites. Deign, therefore, accompanied by your charioteer, to take up your abode in our hermitage for a few days. Go first, reverend Sirs, I will follow you immediately. Sire, the chariot is ready, and only waits to conduct you to victory. But here is a messenger named Karabhaka, just arrived from your capital, with a message from the Queen, your mother. Victory to the King! The Queen-mother bids me say that in four days from the present time she intends celebrating a solemn ceremony for the advancement and preservation of her son. She expects that your Majesty will honour her with your presence on that occasion. Friend Máthavya, as you were my playfellow in childhood, the Queen has already received you like a second son; go you, then, back to her, and tell her of my solemn engagement to assist these holy men. You can supply my place in the ceremony, and act the part of a son to the Queen. Already I feel quite like a young prince. This is a giddy fellow, and in all probability he will let out the truth about my present pursuit to the women of the palace. What is to be done? I must say something to deceive him. Don't distress yourself; I quite understand. How wonderful is the power of King Dushyanta! No sooner did he enter our hermitage, than we were able to proceed with our rites, unmolested by the evil demons. I have but one resource. Oh for another sight of the Idol of my soul! I will seek her. Ah! now my eyes are gratified by an entrancing sight. Yonder is the beloved of my heart reclining on a rock strewn with flowers, and attended by her two friends. How fortunate! Concealed behind the leaves, I will listen to their conversation, without raising their suspicions. Dushyanta. I will peep through those branches. Ah! now my eyes are gratified by an entrancing sight. Yonder is the beloved of my heart reclining on a rock strewn with flowers, and attended by her two friends. How fortunate! Concealed behind the leaves, I will listen to their conversation, without raising their suspicions. We know very little about love-matters, dear Shakoontalá; but for all that, I cannot help suspecting your present state to be something similar to that of the lovers we have heard about in romances. Tell us frankly what is the cause of your disorder. It is useless to apply a remedy, until the disease be understood. What Anasúyá says, dear [S']akoontalá, is very just. Why give so little heed to your ailment? Every day you are becoming thinner; though I must confess your complexion is still as beautiful as ever. Dear friends, to no one would I rather reveal the nature of my malady than to you; but I should only be troubling you. Nay, this is the very point about which we are so solicitous. Sorrow shared with affectionate friends is relieved of half its poignancy. As anxiously I listen for her answer. Letter of Shakuntala to Dushyanta - Well, I will do my best; but my heart trembles when I think of the chances of a refusal....Listen, dear friends, and tell me whether the ideas are appropriately expressed. Of the love that consumes me by day and by night. - SHAKOONTALÁ. Know then, dear friends, that from the first moment the illustrious Prince who is the guardian of our sacred grove presented himself to my sight—Ever since that happy moment, my heart's affections have been fixed upon him, and my energies of mind and body have all deserted me, as you see. You must consent, then, dear friends, to contrive some means by which I may find favour with the King, or you will have ere long to assist at my funeral. Enough! These words remove all my doubts. She is far gone in love, dear Anasúyá, and no time ought to be lost. Since she has fixed her affections on a monarch who is the ornament of Puru's line, we need not hesitate for a moment to express our approval. An idea strikes me, Anasúyá. Let [S']akoontalá write a love-letter;I will conceal it in a flower, and contrive to drop it in the King's path. He will surely mistake it for the remains of some sacred offering, and will, in all probability, pick it up. Well, I will do my best; but my heart trembles when I think of the chances of a refusal....Listen, dear friends, and tell me whether the ideas are appropriately expressed. Welcome, the desire of our hearts, that so speedily presents itself! What do you mean by detaining the King, who must be anxious to return to his royal consorts after so long a separation? Kind Sir, we have heard it said that kings have many favourite consorts. You must not, then, by your behaviour towards our dear friend, give her relations cause to sorrow for her. A sweet reluctant captive to my will. Too envious Fate did mar my daring purpose. King Dushyanta. Listen, gentle maiden, while in a few words I quiet your anxiety. Why this fear of offending your relations, timid maid? When your venerable foster-father hears of it, he will not find fault with you. He knows that the law permits us to be united without consulting him....King Dushyanta. Infringe not the rules of decorum, mighty descendant of Puru. Remember, though I love you, I have no power to dispose of myself. Why this fear of offending your relations, timid maid? When your venerable foster-father hears of it, he will not find fault with you. He knows that the law permits us to be united without consulting him. Have still received their father's benison. Leave me, leave me; I must take counsel with my female friends. Sips the fresh honey from the opening bud. Great Prince, I hear the voice of the matron Gautamí. She is coming this way to inquire after my health. Hasten and conceal yourself behind the branches. My child, is the fever of thy limbs allayed? Venerable mother, there is certainly a change for the better. Let me sprinkle you with this holy water, and all your ailments will depart. The day is closing, my child; come, let us go to the cottage. Oh my heart! thou didst fear to taste of happiness when it was within thy reach. Now that the object of thy desires is torn from thee, how bitter will be thy remorse, how distracting thine anguish!Farewell! bower of creepers, sweet soother of my sufferings, farewell! may I soon again be happy under thy shade. Too envious Fate did mar my daring purpose. This bower, e'en though its living be fled? Prelude to ACT IV. (Scene.—The Garden of the Hermitage). Although, dear Priyamvadá, it rejoices my heart to think that [S']akoontalá has been happily united to a husband in every respect worthy of her, by the form of marriage prevalent among Indra's celestial musicians, nevertheless, I cannot help feeling somewhat uneasy in my mind. You know that the pious King was gratefully dismissed by the hermits on the successful termination of their sacrificial rites. He has now returned to his capital, leaving [S']akoontalá under our care; and it may be doubted whether, in the society of his royal consorts, he will not forget all that has taken place in this hermitage of ours. On that score be at ease. Persons of his noble nature are not so destitute of all honourable feeling. I confess, however, that there is one point about which I am rather anxious. What, think you, will Father Kanwa say when he hears what has occurred? From the first, it was always his fixed purpose to bestow the maiden on a husband worthy of her; and since heaven has given her such a husband, his wishes have been realized without any trouble to himself. The words he uttered in his revellings... -Durvasa. That must be the voice of a guest announcing his arrival. Surely, Shakoontalá is not absent from the cottage. Woe to thee, maiden, for daring to slight a guest like me! The words he uttered in his revellings. Alas! alas! I fear a terrible misfortune has occurred. [S']akoontalá, from absence of mind, must have offended some guest whom she was bound to treat with respect. Ah! yes; I see; and no less a person than the great sage Durvásas, who is known to be most irascible. He it is that has just cursed her, and is now retiring with hasty strides, trembling with passion, and looking as if nothing could turn him. His wrath is like a consuming fire. Go quickly, dear Priyamvadá, throw yourself at his feet, and persuade him to come back, while I prepare a propitiatory offering for him, with water and refreshments. Well, dear Anasúyá, I have done my best; but what living being could succeed in pacifying such a cross-grained, ill-tempered old fellow? However, I managed to mollify him a little. When he refused to turn back, I implored his forgiveness in these words: 'Most venerable sage, pardon, I beseech you, this first offence of a young and inexperienced girl, who was ignorant of the respect due to your saintly character and exalted rank. My word must not be falsified; but, at the sight of the ring of recognition the spell shall cease.' So saying, he disappeared. Oh! then we may breathe again; for, now I think of it, the King himself, at his departure, fastened on [S']akoontalá's finger, as a token of remembrance, a ring on which his own name was engraved. She has, therefore, a remedy for her misfortune at her own command. See, Anasúyá, there sits our dear friend, motionless as a statue, resting her face on her left hand, her whole mind absorbed in thinking of her absent husband. She can pay no attention to herself, much less to a stranger. (Scene—The Neighbourhood of the Hermitage). My master, the venerable Kanwa, who is but lately returned from his pilgrimage, has ordered me to ascertain how the time goes. I have therefore come into the open air to see if it be still dark. And yields her heart a prey to anxious grief. Little as I know of the ways of the world, I cannot help thinking that King Dushyanta is treating Shakoontalá very improperly. I am broad awake, but what shall I do? I have no energy to go about my usual occupations. My hands and feet seem to have lost their power. Well, Love has gained his object; and Love only is to blame for having induced our dear friend, in the innocence of her heart, to confide in such a perfidious man. Possibly, however, the imprecation of Durvása's may be already taking effect. Indeed, I cannot otherwise account for the King's strange conduct, in allowing so long a time to elapse without even a letter; and that, too, after so many promises and protestations. I cannot think what to do unless we send him the ring which was to be the token of recognition. But which of these austere hermits could we ask to be the bearer of it? Then, again, Father Kanwa has just returned from his pilgrimage; and how am I to inform him of Shakoontalá's marriage to King Dushyanta, and her expectation of becoming soon a mother? I never could bring myself to tell him, even if I felt that Shakoontalá had been in fault, which she certainly has not. What is to be done? She was sitting with her face bowed down to the very ground with shame, when Father Kanwa entered, and, embracing her, of his own accord offered her his congratulations. 'I give thee joy, my child,' he said, 'we have had an auspicious omen. The priest who offered the oblation dropped it into the very centre of the sacred fire, though thick smoke obstructed his vision. Henceforth thou wilt cease to be an object of compassion. This very day I purpose sending thee, under the charge of certain trusty hermits, to the King's palace; and shall deliver thee into the hands of thy husband, as I would commit knowledge to the keeping of a wise and faithful student. Oh, my dear Priyamvadá, what delightful news! I am pleased beyond measure; yet when I think that we are to lose our dear [S']akoontalá this very day, a feeling of melancholy mingles with my joy. Quick, quick, Anasúyá! They are calling the hermits who are to go with Sakoontalá to Hastinápur. See! there sits [S']akoontalá, her locks arranged even at this early hour of the morning. The holy women of the hermitage are congratulating her, and invoking blessings on her head, while they present her with wedding-gifts and offerings of consecrated wild-rice. Let us join them. I ought indeed to be grateful for your kind offices, now that I am so soon to be deprived of them. Dear, dear friends, perhaps I shall never be dressed by you again. Bereft for ever of an only daughter. Daughter, see, here comes thy foster-father; he is eager to fold thee in his arms; his eyes swim with tears of joy. Hasten to do him reverence. Purify my child this day! Now then, my daughter, set out on thy journey. Eager as I am, dear Priyamvadá, to see my husband once more, yet my feet refuse to move, now that I am quitting for ever the home of my girlhood. You are not the only one, dearest, to feel the bitterness of parting. As the time of separation approaches, the whole grove seems to share your anguish. Shed their pale leaves, like tears, upon the ground. Hast thou thyself, by thine own merits, won. Banish all anxious thought on thy behalf. My father, see you there my pet deer, grazing close to the hermitage? She expects soon to fawn, and even now the weight of the little one she carries hinders her movements. Do not forget to send me word when she becomes a mother. Without consent or privity of us. To thy just feeling and to destiny. A most suitable message! I will take care to deliver it correctly. Removed from thy bosom, my beloved father, like a young tendril of the sandal-tree torn from its home in the western mountains, how shall I be able to support life in a foreign soil? - SHAKOONTALÁ. Wilt thou a blessing prove, and not a curse. What thinks Gautamí of this advice? An excellent compendium, truly, of every wife's duties! Lay it well to heart, my daughter. Removed from thy bosom, my beloved father, like a young tendril of the sandal-tree torn from its home in the western mountains, how shall I be able to support life in a foreign soil? Daughter, thy fears are groundless. At parting from thy father and thy friends. Dear father, when shall I ever see this hallowed grove again? Till thy pure spirit gain its last release. Come, my child, the favourable time for our journey is fast passing. Let thy father return. Venerable Sire, be thou the first to move homewards, or these last words will never end. Daughter, detain me no longer. My religious duties must not be interrupted. Beloved father, thy frame is much enfeebled by penitential exercises. Do not, oh! do not, allow thyself to sorrow too much on my account. A frequent offering to our household gods? Go, my daughter, and may thy journey be prosperous. Holy father, the sacred grove will be a desert without Sakoontalá. How can we ever return to it? It is natural enough that your affection should make you view it in this light. Lent to a parent till her husband claim her. Is lightened, and I seem to breathe more freely. Hark! my dear friend, listen a minute, and you will hear sweet sounds proceeding from the music-room. Some one is singing a charming air. Who can it be? Oh! I know. The queen Hansapadiká is practising her notes, that she may greet you with a new song. She means to reprove me, because I once paid her great attention, and have lately deserted her for the queen Vasumatí. Go, my dear fellow, and tell Hansapadiká from me that I take her delicate reproof as it is intended. But stay—I don't much relish being sent to bear the brunt of her jealousy. The chances are that she will have me seized by the hair of the head and beaten to a jelly. I would as soon expose myself, after a vow of celibacy, to the seductions of a lovely nymph, as encounter the fury of a jealous woman. Go, go; you can disarm her wrath by a civil speech; but give her my message. Victory to the King! So please your Majesty, some hermits who live in a forest near the Snowy Mountains have arrived here, bringing certain women with them. They have a message to deliver from the sage Kanwa and desire an audience. I await your Majesty's commands. Tell my domestic priest Somaráta to receive the hermits with due honour, according to the prescribed form. He may then himself introduce them into my presence. I will await them in a place suitable for the reception of such holy guests. Here is the terrace of the hallowed fire-chamber, and yonder stands the cow that yields the milk for the oblations. The sacred enclosure has been recently purified, and looks clean and beautiful. Ascend, Sire. Vetravatí, what can possibly be the message that the venerable Kanwa has sent me by these hermits? Crowd through my mind, and fill me with misgiving. If you ask my opinion, Sire, I think the hermits merely wish to take an opportunity of testifying their loyalty, and are therefore come to offer homage to your majesty. Are running to and fro in wild dismay. It is natural that the first sight of the King's capital should affect you in this manner; my own sensations are very similar. So I regard this crowd of pleasure-seekers. Alas! what means this throbbing of my right eyelid? Heaven avert the evil omen, my child! May the guardian deities of thy husband's family convert it into a sign of good fortune! Is half concealed beneath her flowing veil? Like a fresh bud 'mid sear and yellow leaves. These holy men have been received with all due honour. One of them has now a message to deliver from his spiritual superior. Will your Majesty deign to hear it? I trust no one is molesting you in the prosecution of your religious rites. While the sun's beams irradiate the sky? Such, indeed, is the very meaning of my title—'Defender of the Just.' I trust the venerable Kanwa is in good health. The world is interested in his well-being. Holy men have health and prosperity in their own power. He bade us greet your Majesty, and, after kind inquiries, deliver this message. Virtue herself in human form revealed. Since, therefore, she expects soon to be the mother of thy child, receive her into thy palace, that she may perform, in conjunction with thee, the ceremonies prescribed by religion on such an occasion. So please your Majesty, I would add a few words; but why should I intrude my sentiments when an opportunity of speaking my mind has never been allowed me? Didst solemnize thy nuptials with thy wife. Together, then, hold converse; let us leave you. What strange proposal is this? [Aside] His words are like fire to me. In his affection. So her kinsmen will it. Do you really mean to assert that I ever married this lady? [Aside] O my heart, thy worst misgivings are confirmed. Is it becoming in a monarch to depart from the rules of justice, because he repents of his engagements? What charms are here revealed before mine eyes! Ere eagerly I taste the proffered sweetness. - King Dushyanta. I cannot answer a question which is based on a mere fabrication. Such inconstancy is fortunately not common, except in men intoxicated by power. Is that remark aimed at me? Be not ashamed, my daughter. Let me remove thy veil for a little space. Thy husband will then recognize thee. [Removes Shakuntala's veil]. [Aside]What charms are here revealed before mine eyes! Ere eagerly I taste the proffered sweetness. How admirably does our royal master's behaviour prove his regard for justice! Who else would hesitate for a moment when good fortune offered for his acceptance a form of such rare beauty? Great King, why art thou silent? Holy men, I have revolved the matter in my mind; but the more I think of it, the less able am I to recollect that I ever contracted an alliance with this lady. What answer, then, can I possibly give you when I do not believe myself to be her husband, and I plainly see that she is soon to become a mother? [Aside] Woe! woe! Is our very marriage to be called in question by my own husband? Ah me! is this to be the end of all my bright visions of wedded happiness? Beware how thou insult the holy Sage! He should have cursed thee for a ravisher. Shárngarava, speak to him no more. [S']akoontalá, our part is performed; we have said all we have to say, and the King has replied in the manner thou hast heard. It is now thy turn to give him convincing evidence of thy marriage. [Aside] Since his feeling towards me has undergone a complete revolution, what will it avail to revive old recollections? One thing is clear—I shall soon have to mourn my own widowhood. But no—I dare not address thee by this title, since thou hast refused to acknowledge our union. Noble descendant of Puru! It is not worthy of thee to betray an innocent-minded girl, and disown her in such terms, after having so lately and so solemnly plighted thy vows to her in the hermitage. [Stopping his ears].I will hear no more. Be such a crime far from my thoughts! Its turbid waters with the crystal stream? If, then, thou really believest me to be the wife of another, and thy present conduct proceeds from some cloud that obscures thy recollection, I will easily convince thee by this token. Alas! alas! woe is me! There is no ring on my finger! The ring must have slipped off when thou wast in the act of offering homage to the holy water of Shachí's sacred pool, near Sakrávatára. People may well talk of the readiness of woman's invention! Here is an instance of it. Say, rather, of the omnipotence of fate. I will mention another circumstance, which may yet convince thee. By all means let me hear it at once. Voluptuaries may allow themselves to be seduced from the path of duty by falsehoods such as these, expressed in honeyed words. Speak not thus, illustrious Prince. This lady was brought up in a hermitage, and has never learnt deceit. In beings gifted with intelligence. The rearing of her little ones to strangers. Dishonourable man, thou judgest of others by thine own evil heart. Thou, at least, art unrivalled in perfidy, and standest alone—a base deceiver in the garb of virtue and religion—like a deep pit whose yawning mouth is concealed by smiling flowers. Of sudden anger kindled in her eyes. My good lady, Dushyanta's character is well known to all. I comprehend not your meaning. Well do I deserve to be thought a harlot for having in the innocence of my heart, and out of the confidence I reposed in a Prince of Puru's race, entrusted my honour to a man whose mouth distils honey, while his heart is full of poison. Thus it is that burning remorse must ever follow rash actions which might have been avoided, and for which one has only one's self to blame. Fond love is changed into most bitter hate. How now! Do you give credence to this woman rather than to me, that you heap such accusations on me? Who makes a very science of deceit. Most veracious Bráhman, grant that you are in the right, what end would be gained by betraying this lady? This altercation is idle, Shárngarava. We have executed the commission of our preceptor; come, let us return. Receive her or reject her, she is thine. The husband o'er the wife is absolute. Go on before us, Gautamí. My son Sárngarava, see! Shakoontalá is following us, and with tears implores us not to leave her. Alas! poor child, what will she do here with a cruel husband who casts her from him? Wilful woman, dost thou seek to be independent of thy lord?...Shakoontalá! Condemn thee, thou may'st cheerfully endure it. When ranked among the number of his household. Thy duty therefore is to stay. As for us, we must return immediately. Deceive not this lady, my good hermit, by any such expectations. And from another's wife averts his gaze. Since thy union with another woman has rendered thee oblivious of thy marriage with Shakoontalá, whence this fear of losing thy character for constancy and virtue? You must counsel me, revered Sir, as to my course of action. Which of the two evils involves the greater or less sin? Whether by some dark veil my mind be clouded. Or the defiling and defiled adulterer? You must take an intermediate course....I will provide an asylum for the lady in my own house until the birth of her child; and my reason, if you ask me, is this: Soothsayers have predicted that your first-born will have universal dominion. Now, if the hermit's daughter bring forth a son with the discus or mark of empire in the lines of his hand, you must admit her immediately into your royal apartments with great rejoicings; if not, then determine to send her back as soon as possible to her father. I bow to the decision of my spiritual advisor. O divine earth, open and receive me into thy bosom! Near the nymph's pool, and bore her up to heaven. My good priest, from the very first I declined having anything to do with this matter. It is now all over, and we can never, by our conjectures, unravel the mystery; let it rest; go, seek repose. Be it so. Victory to the King! And makes me credit her against my judgment. Take that for a rascally thief that you are; and now tell us, sirrah, where you found this ring—aye, the King's own signet-ring. See, here is the royal name engraved on the setting of the jewel. Mercy! kind sirs, mercy! I did not steal it; indeed I did not....One day I was cutting open a large carp I had just hooked, when the sparkle of a jewel caught my eye, and what should I find in the fish's maw but that ring! Soon afterwards, when I was offering it for sale, I was seized by your honours. Now you know everything. Whether you kill me, or whether you let me go, this is the true account of how the ring came into my possession. Well, Jánuka, the rascal emits such a fishy odour that I have no doubt of his being a fisherman; but we must inquire a little more closely into this queer story about the finding of the ring. Come, we'll take him before the King's household. There's our Superintendent at last, I declare. See! he is coming towards us with a paper in his hand. We shall soon know the King's command; so prepare, my fine fellow, either to become food for the vultures, or to make acquaintance with some hungry cur. Ho, there, Súchaka! set the fisherman at liberty, I tell you. His story about the ring is all correct. Now, master, what think you of my way of getting a livelihood? Here, my good man, the King desired me to present you with this purse. It contains a sum of money equal to the full value of the ring. His Majesty does me too great honour. You may well say so. He might as well have taken you from the gallows to seat you on his state elephant. Master, the King must value the ring very highly, or he would never have sent such a sum of money to this ragamuffin. I don't think he prizes it as a costly jewel so much as a memorial of some person he tenderly loves. The moment it was shown to him he became much agitated, though in general he conceals his feelings. Here's half the money for you, my masters. It will serve to purchase the flowers you spoke of, if not to buy me your good-will. My good fisherman, you are an excellent fellow, and I begin to feel quite a regard for you. Let us seal our first friendship over a glass of good liquor. Come along to the next wine-shop, and we'll drink your health. Behold me just arrived from attending in my proper turn at the nymph's pool, where I have left the other nymphs to perform their ablutions, whilst I seek to ascertain, with my own eyes, how it fares with King Dushyanta. My connexion with the nymph Menaká has made her daughter Sakoontalá dearer to me than my own flesh and blood; and Menaká it was who charged me with this errand on her daughter's behalf. How is it that I see no preparations in the King's household for celebrating the great vernal festival? I could easily discover the reason by my divine faculty of meditation but respect must be shown to the wishes of my friend. How then shall I arrive at the truth? I know what I will do. I will become invisible, and place myself near those two maidens who are tending the plants in the garden. Hold there, thoughtless woman [the two maids in the garden]. What are you about, breaking off those mango-blossoms, when the King has forbidden the celebration of the spring festival? Pardon us, kind Sir, we have heard nothing of it. You have heard nothing of it? Why, all the vernal plants and shrubs, and the very birds that lodge in their branches, show more respect to the King's order than you do....But tell us, kind Sir, why has the King prohibited the usual festivities? We are curious to hear, if we may. Men are naturally fond of festive entertainments. There must be some good reason for the prohibition. The whole affair is now public; why should I not speak of it? Has not the gossip about the King's rejection of Shakoontalá reached your ears yet? Oh yes, we heard the story from the King's brother-in-law, as far, at least, as the discovery of the ring. Then there is little more to tell you. As soon as the King's memory was restored by the sight of his own ring, he exclaimed: 'Yes, it is all true. I remember now my secret marriage with Shakoontalá. When I repudiated her, I had lost my recollection!' Ever since that moment, he has yielded himself a prey to the bitterest remorse. In short, the King is so completely out of his mind that the festival has been prohibited....Oh! here comes his Majesty in this direction. Pass on, maidens; attend to your duties. Now that I have seen him, I can well understand why [S']akoontalá should pine after such a man, in spite of his disdainful rejection of her. Forget myself, full soon remorse doth wake me. My poor Shakoontalá's sufferings are very similar. He is taken with another attack of this odious Shakoontalá-fever. How shall we ever cure him? Victory to the King! Great Prince, the royal pleasure-grounds have been put in order. Your Majesty can resort to them for exercise and amusement whenever you think proper. Vetravatí, tell the worthy Pishuna, my prime minister, from me, that I am so exhausted by want of sleep that I cannot sit on the judgment-seat to-day. If any case of importance be brought before the tribunal, he must give it his best attention, and inform me of the circumstances by letter. Now that you have rid yourself of these troublesome fellows, you can enjoy the delightful coolness of your pleasure-grounds without interruption. Ah! my dear friend, there is an old adage:—'When affliction has a mind to enter, she will find a crevice somewhere;' and it is verified in me. His keenest shaft, and aims it at my breast. Well, then, wait a moment; I will soon demolish Master Káma's arrow with a cut of my cane. That will do. I see very well the god of love is not a match for a Bráhman. And now, my dear friend, where shall I sit down, that I may enchant my sight by gazing on the twining plants, which seem to remind me of the graceful shape of my beloved? Don't you remember? you told your personal attendant, Chaturiká, that you would pass the heat of the day in the jasmine-bower; and commanded her to bring the likeness of your queen [S']akoontalá, sketched with your own hand. True. The sight of her picture will refresh my soul. Lead the way to the arbour. Here we are at the jasmine-bower. Look, it has a marble seat, and seems to bid us welcome with its offerings of delicious flowers. You have only to enter and sit down. Oh! my dear friend, how vividly all the circumstances of my union with [S']akoontalá present themselves to my recollection at this moment! But tell me now how it was that, between the time of my leaving her in the hermitage and my subsequent rejection of her, you never breathed her name to me? True, you were not by my side when I disowned her; but I had confided to you the story of my love, and you were acquainted with every particular. Did it pass out of your mind as it did out of mine? How can I be otherwise than inconsolable, when I call to mind the agonized demeanour of the dear one on the occasion of my disowning her? That brooked not contradiction, bade her stay. Which like a poisoned shaft torments me still. [Aside] Alas! such is the force of self-reproach following a rash action. But his anguish only rejoices me. An idea has just struck me. I should not wonder if some celestial being had carried her off to heaven. Very likely. Who else would have dared to lay a finger on a wife, the idol of her husband? It is said that Menaká, the nymph of heaven, gave her birth. The suspicion has certainly crossed my mind that some of her celestial companions may have taken her to their own abode. [Aside] His present recollection of every circumstance of her history does not surprise me so much as his former forgetfulness. If that's the case, you will be certain to meet her before long. No father and mother can endure to see a daughter suffering the pain of separation from her husband. The precipice o'er which my hopes have fallen. Do not despair in this manner. Is not this very ring a proof that what has been lost may be unexpectedly found? Bright as the dawn; and now how changed thy lot! [Aside] Had it found its way to the hand of any other person, then indeed its fate would have been deplorable. Pray, how did the ring ever come upon her hand at all? I myself am curious to know. Repeat each day one letter of the name Engraven on this gem; ere thou hast reckoned The tale of syllables, my minister Shall come to lead thee to thy husband's palace. But, hard-hearted man that I was, I forgot to fulfil my promise, owing to the infatuation that took possession of me. Sánumatí: [Aside] A pleasant arrangement! Fate, however, ordained that the appointment should not be kept. But how did the ring contrive to pass into the stomach of that carp which the fisherman caught and was cutting up? It must have slipped from my Shakoontalá's hand, and fallen into the stream of the Ganges, while she was offering homage to the water of Shachí's holy pool. Sánumatí: [Aside] Hence it happened, I suppose, that the King, always fearful of committing the least injustice, came to doubt his marriage with my poor Sakoontalá. But why should affection so strong as his stand in need of any token of recognition? O forsaken one, unjustly banished from my presence, take pity on thy slave, whose heart is consumed by the fire of remorse, and return to my sight. Here is the Queen's portrait. Excellent, my dear friend, excellent! The imitation of nature is perfect, and the attitude of the figures is really charming. They stand out in such bold relief that the eye is quite deceived. Sánumatí: [Aside] A most artistic performance! I admire the King's skill, and could almost believe that Shakoontalá herself was before me. But feebly her angelic loveliness. And fancy must supply the imperfection. Sánumatí: [Aside] A very just remark from a modest man, whose affection is exaggerated by the keenness of his remorse. Tell me:—I see three female figures drawn on the canvas, and all of them beautiful; which of the three is her Majesty [S']akoontalá? Has fallen on the cheek and dimmed its brightness. So please your Majesty, your prime minister begs respectfully to inform you that he has devoted much time to the settlement of financial calculations, and only one case of importance has been submitted by the citizens for his consideration. He has made a written report of the facts, and requests your Majesty to cast your eyes over it. What have we here? 'A merchant named Dhanamitra, trading by sea, was lost in a late shipwreck. Though a wealthy trader, he was childless; and the whole of his immense property becomes by law forfeited to the king.' So writes the minister. Alas! alas! for his childlessness! But surely, if he was wealthy, he must have had many wives. Let an inquiry be made whether any one of them is expecting to give birth to a child. They say that his wife, the daughter of the foreman of a guild belonging to Ayodhyá , has just completed the ceremonies usual upon such expectations. That kinsman's place in tenderest affection. Your Majesty's proclamation was received with acclamations of joy, like grateful rain at the right season. So, then, the property of rich men, who have no lineal descendants, passes over to a stranger at their decease. And such, alas! must be the fate of the fortunes of the race of Puru at my death; even as when fertile soil is sown with seed at the wrong season....Fool that I was to reject such happiness when it offered itself for my acceptance! Sánumatí: [Aside] He may well blame his own folly when he calls to mind his treatment of my beloved Shakoontalá. Lies hidden in the bosom of the earth. Alas! the shades of my forefathers are even now beginning to be alarmed, lest at my death they may be deprived of their funeral libations. A childless man can ever hope to make them. Sánumatí: [Aside] Alas! alas! though a bright light is shining near him, he is involved in the blackest darkness, by reason of the veil that obscures his sight. I will now reveal all, and put an end to his misery. But no; I heard the mother of the great Indra, when she was consoling Shakoontalá, say that the gods will soon bring about a joyful union between husband and wife, being eager for the sacrifice which will be celebrated in their honour on the occasion. I must not anticipate the happy moment, but will return at once to my dear friend and cheer her with an account of what I have seen and heard. [She rises aloft and disappears]. Help! help! to the rescue! Your friend [Máthavya] is in danger; save him, great King....Some evil demon, invisible to human eyes, has seized him, and carried him to one of the turrets of the Palace of Clouds. As a fierce tiger rends his struggling prey. Yet all its vaunted power shall be as nought. What! dares he defy me to my face? Hold there, monster! Prepare to die, for your time is come. Help! Save me! I can see you, though you cannot see me. I am like a mouse in the claws of a cat; my life is not worth a minute's purchase. Avaunt, monster! You may pride yourself on the magic that renders you invisible, but my arrow shall find you out. Thus do I fix a shaft That shall discern between an impious demon, And a good Bráhman; bearing death to thee, To him deliverance—even as the swan Distinguishes the milk from worthless water. But on thy friends cast only looks of favour. What, Mátali! Welcome, most noble charioteer of the mighty Indra. So, here is a monster who thought as little about slaughtering me as if I had been a bullock for sacrifice, and you must e'en greet him with a welcome. Great Prince, hear on what errand Indra sent me into your presence....There is a race of giants, the descendants of Kálanemi, whom the gods find it difficult to subdue. So I have already heard from Nárada. Leaves the pale moon to dissipate the darkness. Let your Majesty, therefore, ascend at once the celestial car of Indra; and, grasping your arms, advance to victory. The mighty Indra honours me too highly by such a mark of distinction. But tell me, what made you act thus towards my poor friend Máthavya? I will tell you. Perceiving that your Majesty's spirit was completely broken by some distress of mind under which you were labouring, I determined to rouse your energies by moving you to anger. Because To light a flame, we need but stir the embers; The cobra, when incensed, extends his head And springs upon his foe; the bravest men Display their courage only when provoked. Is braced against the enemies of heaven. My good Mátali, it appears to me incredible that I can merit such a mark of distinction for having simply fulfilled the behests of the great Indra. Great Prince, it seems to me that neither of you is satisfied with himself. For your heroic deeds on his behalf. My good Mátali, yesterday, when I ascended the sky, I was so eager to do battle with the demons, that the road by which we were travelling towards Indra's heaven escaped my observation. Tell me, in which path of the seven winds are we now moving? Their several rays with equal distribution. He spanned the heavens in his second stride. This is the reason, I suppose, that a sensation of calm repose pervades all my senses.Ah! Mátali, we are descending towards the earth's atmosphere....The car itself instructs me; we are moving O'er pregnant clouds, surcharged with rain; below us I see the moisture-loving Chátakas.In sportive flight dart through the spokes; the steeds Of Indra glisten with the lightning's flash;And a thick mist bedews the circling wheels. Tell me, Mátali, what is the range of mountains which, like a bank of clouds illumined by the setting sun, pours down a stream of gold? On one side its base dips into the eastern ocean, and on the other side into the western. Great Prince, it is called 'Golden-peak,' and is the abode of the attendants of the god of wealth. In this spot the highest forms of penance are wrought out. Does holy penance for the good of mortals. Then I must not neglect so good an opportunity of obtaining his blessing. I should much like to visit this venerable personage and offer him my homage. If your Majesty will rest under the shade, at the foot of this Ashoka-tree, I will seek an opportunity of announcing your arrival to Indra's reputed father. Wherefore this causeless throbbing, O mine arm? Is lost, and nought but misery remains. Be not so naughty. Do you begin already to show a refractory spirit? This is no place for petulance. Who can it be whose behaviour calls for such a rebuke? A child, is it? closely attended by two holy women. His disposition seems anything but child-like. See! Tearing its tender mane in boisterous sport. Open your mouth, my young lion, I want to count your teeth. You naughty child, why do you tease the animals? Know you not that we cherish them in this hermitage as if they were our own children? In good sooth, you have a high spirit of your own, and are beginning already to do justice to the name Sarva-damana ('All-taming'), given you by the hermits. Strange! My heart inclines towards the boy with almost as much affection as if he were my own child. What can be the reason? I suppose my own childlessness makes me yearn towards the sons of others. This lioness will certainly attack you if you do not release her whelp. Oh! indeed! let her come. Much I fear her, to be sure! To fan the flame and raise a conflagration. Let the young lion go, like a dear child, and I will give you something else to play with. Where is it? Give it me first. How's that? His hand exhibits one of those mystic marks which are the sure prognostic of universal empire. See! His fingers stretched in eager expectation To grasp the wished-for toy, and knit together By a close-woven web, in shape resemble. A lotus blossom, whose expanding petals The early dawn has only half unfolded. We shall never pacify him by mere words, dear Suvratá. Be kind enough to go to my cottage, and you will find there a plaything belonging to Márkandeya, one of the hermit's children. It is a peacock made of china-ware, painted in many colours. Bring it here for the child. No, no; I shall go on playing with the young lion. I feel an unaccountable affection for this wayward child. The child that asks a refuge in their arms! His pearly teeth just budding into view. 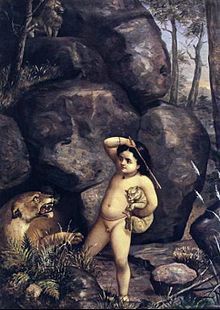 Kind Sir, could you come hither a moment and help me to release the young lion from the clutch of this child who is teasing him in boyish play? Listen to me, thou child of a mighty saint! Dost thou dare show a wayward spirit here? To shield from harm the tenants of the wood. Gentle Sir, I thank you; but he is not the saint's son. Transport the father's soul who gave him being! I am astonished at the striking resemblance between the child and yourself; and, what is still more extraordinary, he seems to have taken to you kindly and submissively, though you are a stranger to him. If he be not the son of the great sage, of what family does he come, may I ask? Of the race of Puru. And bind themselves by rigid vows of penance. But how could mortals by their own power gain admission to this sacred region? Your remark is just; but your wonder will cease when I tell you that his mother is the offspring of a celestial nymph, and gave him birth in the hallowed grove of Kashyapa. Strange that my hopes should be again excited! But what, let me ask, was the name of the prince whom she deigned to honour with her hand? How could I think of polluting my lips by the mention of a wretch who had the cruelty to desert his lawful wife? Ha! the description suits me exactly. Would I could bring myself to inquire the name of the child's mother!But it is against propriety to make too minute inquiries about the wife of another man. Sarva-damana, Sarva-damana, see, see, what a beautiful Shakoonta (bird). My mother! Where? Let me go to her. King:[Aside]What! is his mother's name Shakoontalá? But the name is not uncommon among women. Alas! I fear the mere similarity of a name, like the deceitful vapour of the desert, has once more raised my hopes only to dash them to the ground. Alas! alas! I do not see the amulet on his wrist. Don't distress yourself. Here it is. It fell off while he was struggling with the young lion. Hold! hold! Touch it not, for your life. How marvellous! He has actually taken it up without the slightest hesitation. Why did you try to prevent my touching it? Listen, great Monarch. This amulet, known as 'The Invincible,' was given to the boy by the divine son of Maríchi, soon after his birth, when the natal ceremony was performed. Its peculiar virtue is, that when it falls on the ground, no one except the father or mother of the child can touch it unhurt. And suppose another person touches it? [After embracing the child, aside] Joy! joy! Are then my dearest hopes to be fulfilled? Come, my dear Suvratá, we must inform [S']akoontalá immediately of this wonderful event, though we have to interrupt her in the performance of her religious vows. Don't hold me. I want to go to my mother. We will go to her together, and give her joy, my son. Dushyanta is my father, not you. I have just heard that Sarva-damana's amulet has retained its form, though a stranger raised it from the ground. I can hardly believe in my good fortune. Yet why should not Sánumatí's prediction be verified? [Aside]Alas! can this indeed be my Shakoontalá? The vow to which my cruelty condemned her. Surely this is not like my husband; yet who can it be that dares pollute by the pressure of his hand my child, whose amulet should protect him from a stranger's touch? Mother, who is this man that has been kissing me and calling me his son? My best beloved, I have indeed treated thee most cruelly, but am now once more thy fond and affectionate lover. Refuse not to acknowledge me as thy husband. Be of good cheer, my heart. The anger of Destiny is at last appeased. Heaven regards thee with compassion. But is he in very truth my husband? With the soft lustre of his Rohiní. Make me already more than conqueror. Mother, who is this man? My child, ask the deity that presides over thy destiny. Will he not cast it from him as a serpent? Rise, my own husband, rise. Thou wast not to blame. My own evil deeds, committed in a former state of being, brought down this judgment upon me. How else could my husband, who was ever of a compassionate disposition, have acted so unfeelingly? But tell me, my husband, how did the remembrance of thine unfortunate wife return to thy mind? As soon as my heart's anguish is removed, and its wounds are healed, I will tell thee all. When in his madness he rejected thee. [Seeing the signet-ring on his finger] Ah! my dear husband, is that the Lost Ring? Yes; the moment I recovered it my memory was restored. The ring was to blame in allowing itself to be lost at the very time when I was anxious to convince my noble husband of the reality of my marriage. Receive it back, as the beautiful twining-plant receives again its blossom in token of its reunion with the spring. Nay; I can never more place confidence in it. Let my husband retain it. I congratulate your Majesty. Happy are you in your reunion with your wife; happy are you in beholding the face of your own son. Yes, indeed. My heart's dearest wish has borne sweet fruit. But tell me, Mátali, is this joyful event known to the great Indra? What is unknown to the gods? But come with me, noble Prince, the divine [[Kashyapa graciously permits thee to be presented to him. Shakoontalá, take our child and lead the way. We will together go into the presence of the holy Sage. I shrink from entering the august presence of the great Saint, even with my husband at my side. Nay; on such a joyous occasion it is highly proper. Come, come; I entreat thee. Does battle with the enemies of heaven. But a mere symbol of divinity. He bears in his noble form all the marks of dignity. Sire, the venerable progenitors of the celestials are gazing at your Majesty with as much affection as if you were their son. You may advance towards them. He took upon himself the shape of mortals? Most august of beings! Dushyanta, content to have fulfilled the commands of your son Indra, offers you his adoration. My son, long may'st thou live, and happily may'st thou reign over the earth! My son, may'st thou ever be invincible in the field of battle! I also prostrate myself before you, most adorable Beings, and my child with me. May'st thou be faithful as the god's own wife! My daughter, may'st thou be always the object of thy husband's fondest love; and may thy son live long to be the joy of both his parents! Be seated. Of virtue, wealth, and energy united! The wishes of my heart were all fulfilled. It is thus that the great progenitors of the world confer favours. No vestige of its presence save its footsteps. My son, cease to think thyself in fault. Even the delusion that possessed thy mind was not brought about by any act of thine. Listen to me. Know that when the nymph Menaká, the mother of Shakoontalá, became aware of her daughter's anguish in consequence of the loss of the ring at the nymph's pool, and of thy subsequent rejection of her, she brought her and confided her to the care of Adití. And I no sooner saw her than I ascertained by my divine faculty of meditation, that thy repudiation of thy poor faithful wife had been caused entirely by the curse of Durvásas—not by thine own fault—and that the spell would terminate on the discovery of the ring. Oh! what a weight is taken off my mind, now that my character is cleared of reproach. Joy! joy! My revered husband did not, then, reject me without good reason, though I have no recollection of the curse pronounced upon me. But, in all probability, I unconsciously brought it upon myself, when I was so distracted on being separated from my husband soon after our marriage. For I now remember that my two friends advised me not to fail to show the ring in case he should have forgotten me. That made thy tender husband harsh towards thee. Thou didst regain thine empire o'er his heart. That dimmed its wonted lustre, is removed. Holy father, see here the hope of my royal race. And call him the supporter of the world. We cannot but entertain the highest hopes of a child for whom your Highness performed the natal rites. My revered husband, should not the intelligence be conveyed to Kanwa, that his daughter's wishes are fulfilled, and her happiness complete? He is [S']akoontalá's foster-father. Menaká, who is one of my attendants, is her mother, and dearly does she love her daughter. [Aside] The venerable matron has given utterance to the very wish that was in my mind. His penances have gained for him the faculty of omniscience, and the whole scene is already present to his mind's eye. Then most assuredly he cannot be very angry with me. Nevertheless, it becomes us to send him intelligence of this happy event, and hear his reply. What ho there! Holy father, what are your commands? My good Gálava, delay not an instant, but hasten through the air and convey to the venerable Kanwa, from me, the happy news that the fatal spell has ceased, that Dushyanta's memory is restored, that his daughter Shakoontalá has a son, and that she is once more tenderly acknowledged by her husband. And now, my dear son, take thy consort and thy child, re-ascend the car of Indra, and return to thy imperial capital. Most holy father, I obey. Unnumbered benefits on earth and heaven. Holy father, I will strive, as far as I am able, to attain this happiness. What other favour can I bestow on thee, my son? From future transmigrations save my soul.